It is quite natural to feel alarmed when you discover a lump in your armpit or anywhere in your body. Do not panic. In most cases, this is nothing serious and is usually nothing more than a swollen lymph node. However, it is still a good idea to consult a doctor if the lump is painful.They will look for underlying causes and help you determine the best treatment option. This is the most common cause of armpit lumps. You have lymph nodes throughout your body that swell when you have an infection. Swollen lymph node in the armpit may indicate an infection in that area or elsewhere in your body. You can get a localized infection due to a nick from shaving or using an antiperspirant. You will notice these glands become quite tender and painful while they fight infections. Sometimes, there are additional symptoms of an infection, including a sore throat, fever, or cough. These lymph nodes may swell due to glandular fever, cold, or other types of infections. The swollen nodes will clear up once the infection is no longer there. Just be sure to stay hydrated and take plenty of rest to give your immune system strength to eliminate infections. OTC medicines such as ibuprofen and paracetamol may help with pain, soreness, and fever. That painful lump in armpit may well be a cyst, especially if you notice your skin to become yellowish in color. It is also easy to roll the lump under your skin with gentle pressure. It is more likely to be an abscess if it is large and painful and form on or under your skin. You will notice your skin become red. Both abscesses and cysts may result from the excessive use of antiperspirants or shaving your armpits the wrong way. You may have developed an infected ingrown hair in your armpit that can be quite painful, especially when it turns into puss-filled sores. The natural friction around them may cause bruising that will aggravate the whole thing. 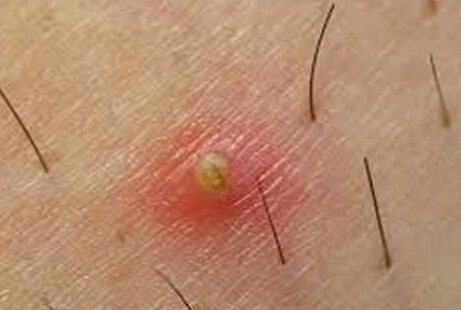 You may develop ingrown hair by using poor shaving techniques, especially when you have curly hair. Some deodorants may also cause armpit razor burns and bumps. If you notice a lump in your armpit, it could be a sign of breast cancer. You have your breast tissue extended up into your armpit, so a lump in that area may indicate breast cancer. This could be a lymph node swollen while trying to filter out cancer cells and infections. It is therefore a good idea to see your doctor for confirmation, especially if you do not see any improvement in a couple of weeks or so. How Can I Tell Whether It Is Cancer or Not? Having a painful lump in armpitcan always make you feel worried. The major concern is whether it is cancer or something else. It is less likely to be a sign of cancer if you can move the lump with fingers and it is somewhat painful. If your lump in the armpit increases in size in a few days, it usually means you have an infection.Soreness or redness of the skin also indicates an infection rather than cancer. Keep in mind that having a lump that is hard, painless, and fixed does not automatically mean that it is cancerous. An unexplained lump usually has a 4% chance of being cancerous, especially if you are over 40 years of age. You should see a doctor though if your lump does not improve in a couple of weeks. Your doctor will ask you for how long you have had that lump and if it has changed size recently. They may also ask if it hurts bad and is becoming worse as compared to when you first noticed it. They may also look for other symptoms to make a diagnosis. They are more likely to ask for certain tests if they are still unsure after a physical exam. They may ask for a mammogram, CT scan, and ultrasound to know more about your painful lump in armpit.In some cases, your doctor may ask for fine needle aspiration that involves drawing fluid from the affected node for analysis. A biopsy is usually ordered when other tests are inconclusive. You may have to take certain antibiotics if your lump is due to a bacterial infection in the body. You cannot do much if it is caused by a viral infection, but it is a good idea to get a vaccination for the most common viral infections to avoid dealing with such issue. They may consider draining the lump if they believe it is a cyst or abscess. These cysts will go away once they have been drained. They may recommend surgical excision if your lump is painful, large, or malignant. The process involves making a small incision in the skin to remove the lump. They may recommend chemotherapy if you they believe your armpit lump is caused by cancer. Radiation therapy and other cancer treatments may also be used. What Causes Swollen Lymph Node Under the Jaw? Why Would Smallpox Vaccination Leave a Scar?